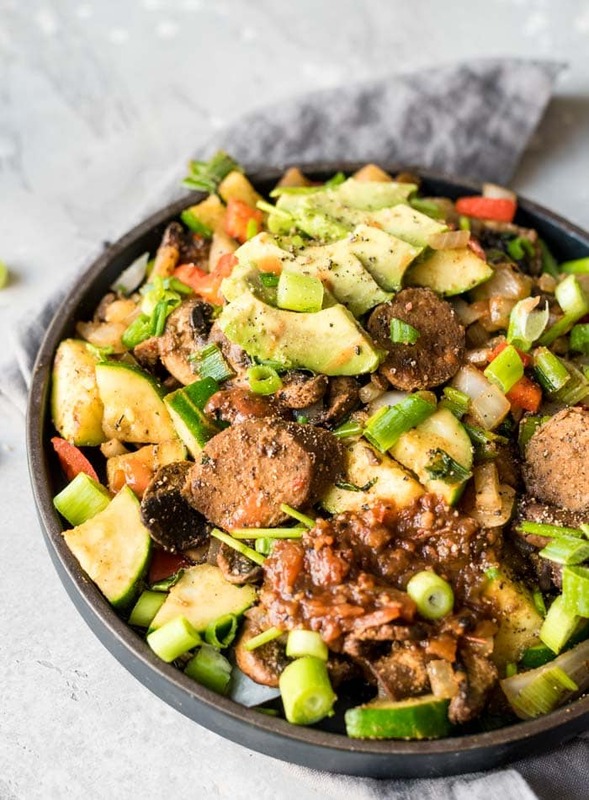 This savory Southwest, easy vegan breakfast skillet features loads of veggies cooked up with vegan sausage and spices for a filling, high-fibre meal that’s perfect for energizing your day. You can customize the veggies based on your preference and switch up the protein by using tempeh, chickpeas, pinto beans or black beans. This recipe is oil-free and sugar-free. Try it for a delicious, healthy plant-based breakfast. Veggies. 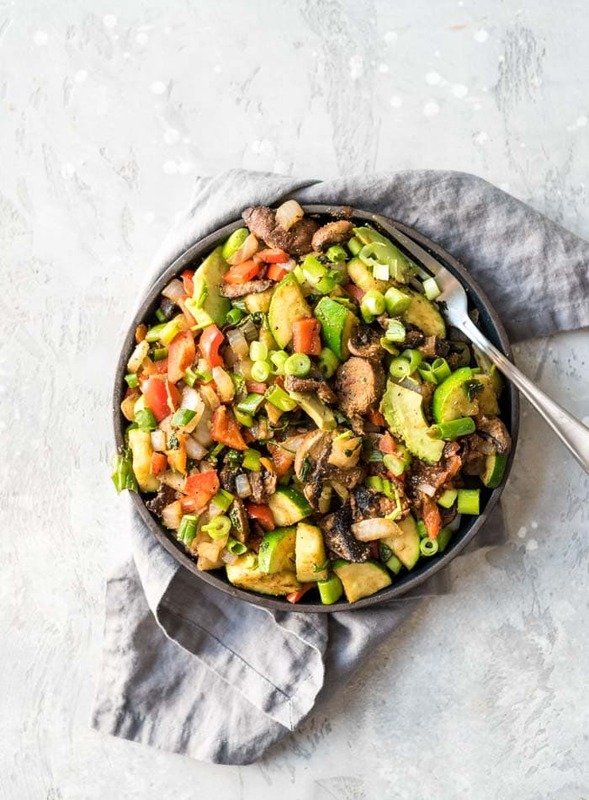 You can pretty much use any vegetables in this recipe but I used mushrooms, zucchini, red bell pepper, cilantro, green onion, garlic and white onion. Toss ’em all in the pan together, fry them up and that’s about all there is too it. Spices. For a Southwest-inspired flavour I used chili powder, cumin, paprika and garlic powder. You can adjust the spices to your liking. Even just salt and pepper is delicious. Protein. I added a sliced Field Roast vegan sausage to add protein to this dish. Other protein sources you can try are any other homemade or store-bought vegan sausage, chickpeas, black beans, pinto beans, tempeh or tofu. Pinto beans or black beans would be yummy with the Southwest spices. Toppings. To finish this breakfast skillet off Southwest-style, I topped it with avocado and salsa. Some refried beans would be nice too! Field Roast and Tofurky sausages both contain gluten but there are some good gluten-free vegan meat alternatives available or you can always make your own of course. If you need to make this gluten-free, use a gluten-free vegan sausage or breakfast patty such as the DIY Breakfast Sausage from Tofurky, or try some cubed or crumbled tempeh or tofu or beans. I don’t eat these processed vegan meat alternatives very often but I have no problem with them for a treat. If you want this to be whole food plant-based, opt cubed tempeh or beans. I make it with tempeh often and it’s really good. You can add the tempeh plain or marinate it first like in this recipe. 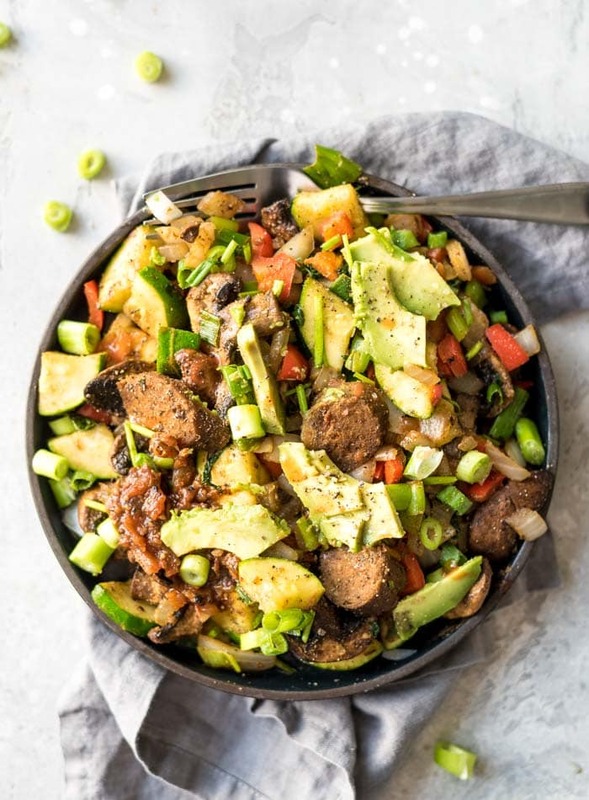 This recipe is low in carbohydrates so if you need a more substantial breakfast, I’d suggest adding a nice portion of roasted or boiled, cubed potato or sweet potato to the pan with the rest of the veggies. It would also be yummy served over some brown rice or quinoa. To up the fat, add more avocado or a few tablespoons of hemp seeds, or keep it as is and serve alongside toast with almond butter, avocado toast, tofu scramble or a smoothie like my beet orange smoothie or carrot cake smoothie. I don’t use any oil when I’m cooking in a pan like this. It’s really not necessary. Just use a splash of water or vegetable broth or if you have a good non-stick pan, you really don’t need anything as the veggie will release some liquid as they cook. If they start to stick, just add a splash of water and keep on cooking! 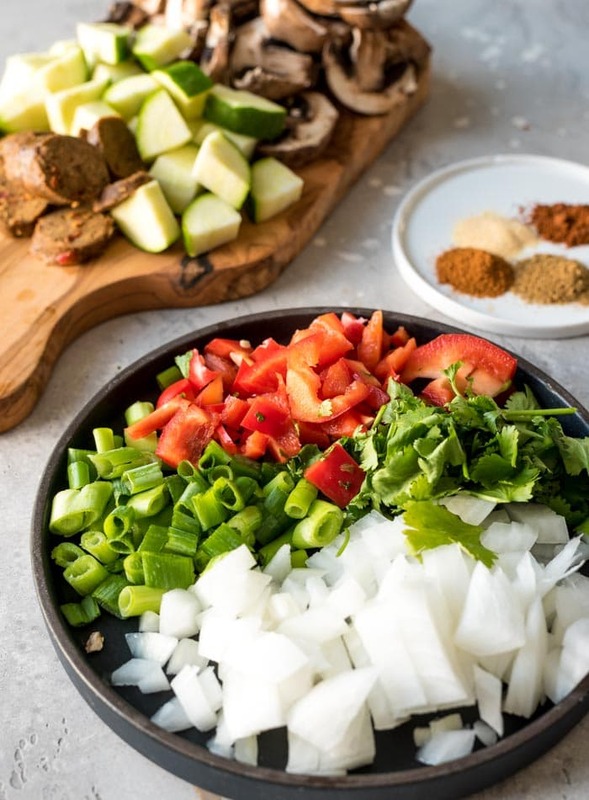 Use any veggies up to 2-3 cups such as spinach or kale, zucchini or cooked squash, boiled or roasted potatoes or sweet potato, bell pepper, any kind of onion, any kind of mushrooms, cooked brussel sprouts or raw shredded brussel sprouts or chopped green cabbage. To bump up the nutrition and sneak in a serving of greens, I’d suggest adding a handful of spinach or kale at the end and stirring in until lightly cooked. Add various toppings such as tofu ricotta, vegan cheese, nutritional yeast, avocado, salsa, refried beans or coconut bacon. Top with a sauce such as my cashew chipotle sauce, chimmichurri sauce or vegan pesto. Since this simple skillet doesn’t have potato or sweet potato, it only takes about 10 minutes to make. 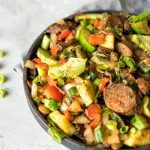 Chop up all the veggies, throw them in a pan with the spices and sausage, cook it up and serve. This recipe serves one but can easily be doubled or tripled. Most of the calories in this recipe come from the vegan Mexican Chipotle Field Roast Sausage. If you use tempeh, tofu or beans, you’ll have to adjust for that. Each serving provides 361 calories with 12 grams of fat, 32 grams of carbohydrates and 34 grams of protein. 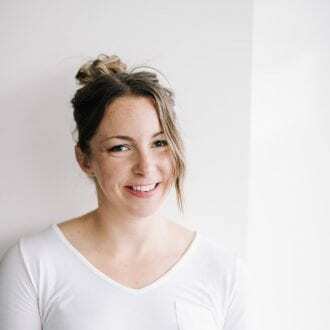 You’ll also be getting grams of 7 dietary fibre and loads of micronutrients from all the veggies, which you can find in the nutrition facts box below. 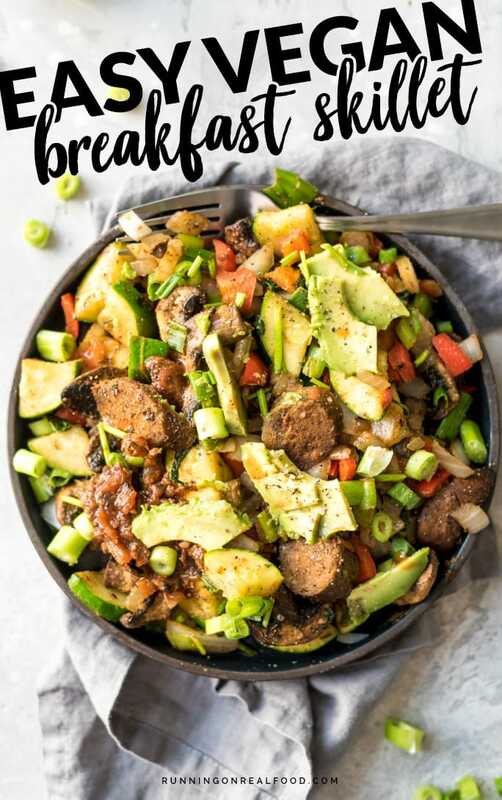 There isn’t much too this quick breakfast skillet. Chop some veggies, throw them in a pan, fry it up and serve! To make it more substantial, add some roasted or boiled cubed potatoes or sweet potatoes. This recipe is completely customizable so go ahead and use any veggies you like or whatever you have on hand. Add everything to a skillet and cook over medium-high heat (add a few splashes of water if it starts to stick to the pan) until the veggies are softened and nicely browned, about 6-7 minutes. Season with salt and pepper, top with avocado, salsa, extra chopped green onion and fresh cilantro and hot sauce if desired and serve right away.